Welcome back to Your Loan Depot’s one and only blog space! 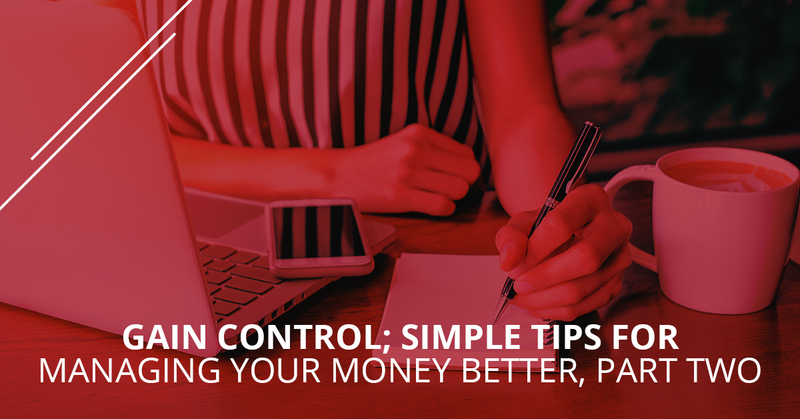 We’ll pick back up right where we left off in our previous post, seeing as how we are in the middle of a two-part series concerning simple tips for more effectively managing money. In part one, we took the opportunity to offer up five tips: cut back on your daily expenses, stay ahead of the curve by paying your bills, do some research on your expenses (are you paying too much for car insurance or internet? ), take advantage of your tax bracket by consulting a professional, and set tangible goals by writing them down. Go ahead and read part one in its entirety, if you get the chance, because there are a couple actionable items to be found therein. But if there were just one tip you remember from that post, it would have to be setting goals. In fact, it’s so important, that’s how we are going to kick-off today’s post — setting goals and being honest with yourself is that important! Not only is being honest with yourself a key to better money management, but it’s also crucial to achieving any sort of challenge. Be it personal, professional, mental, social, or spiritual, if you don’t take a look at what you truly want, you’ll never be as happy as you might be! Likewise, if you fail to be sufficiently honest with yourself about what kind of habits, relationships, and behaviors might inhibit you from reaching said goals…again, you won’t be nearly as likely to actually accomplish them. Once you’ve written down your goals, how you plan to achieve them, and how you might not achieve them, it’s time to get serious about budgeting and money management. Keep reading to get our guide to incorporating better money management habits! Track Your Expenses – In part one, we discussed how you most likely do not need to be a spreadsheet wizard in order to get a feel for where you can save on your daily expenditures. For most, we don’t need to do too deep of a dive into our financial records to learn where our weak points are. Whether it’s at the casino, the coffee shop, the bar, or your favorite fast food joint, we can all probably pinpoint an area or two in which we could exhibit better self-control. But others of us have already done that, but we still want to improve our day-to-day spending habits. In this case, it’s time to track your expenses more formally. It could be by hand or computer program, but it’s important to track every expense you have. That’s right — every latte, cheeseburger, lottery ticket, and grocery. Total this amount every week (or month, it’s up to you). If you are having a hard time keeping track of all these things, just use your bank’s online statements. It’s all right there! And honestly, who has time to write down every expense as they occur. Use the internet, it’s a wonderful thing. Make A Budget! – You knew it, didn’t you? You knew we’d be boring and overly parental with our suggestions for budgeting. Well, all we can say is you’ve got to deal with it, if you really want to get your head above the water, financially speaking! Once you’ve successfully diagnosed (via tracking your expenses) where all of your money is going, you can make a budget to make sure you don’t spend more money than you are able to on a daily basis. Breaking the budget down into daily spend is a great way to make it more achievable. When the numbers get too big, they get too vague as well. When making your budget, make sure that you include expenses that occur every so often, if not every month. This might be routine car maintenance or something similar. Failing to plan is planning to fail! Familiarize Yourself With Online Banking – We already mentioned this briefly above, but online banking allows budgeting to be genuinely easier than ever before. Online banking, in many cases, allows you to schedule future bill payments, review your spending history, and even provide you with a reminder if you need to make a payment that isn’t automatically set up! Most all banks provide these basic services. Reduce the interest you are paying on your debts – The cycle of debt is a vicious one. If you aren’t careful, you can inadvertently end up digging yourself into a hole that’s deeper and deeper. That’s why it’s key to attack your debt with everything you’ve got. This is especially the case if we are discussing credit card debt. Prioritize paying off the debts with the highest interest rates before any others. Then consider consolidating all of your debts into an “all-in-one” program so you can make one payment each month. This will diminish the chances that you’ll forget about a payment — something that is sure to nip you in the bud later on down the road. Take Advantage Of Your Employer’s Plans – It might be the case that you’ve been assuming your employer doesn’t offer any retirement plans, matching plans, or even a certain level of health insurance coverage. Do your due diligence here; bug your HR staff person to get you all the information they have. Then ask them for help if you are confused. After all, that’s what they are there for! The above tips will help you get grounded and stay on your feet for the long-term. Of course, it will take significant work to get results from these methods. We know that isn’t fun news, but it’s the reality of the situation. And it’s the exact reason why effective money management is so difficult! It takes a daily commitment, cutting back on the habits and luxuries that you’ve grown accustomed to. So too does taking time out of your day to make sure you are aligned with your personal budget. But hey! Nobody said it was easy. It will be worth it, however. While this blog post has been about long-term financial planning, Your Loan Depot has been and will always be about helping Texas residents with emergency cash needs. If you are looking for a fast and convenient way to get the payday loan you need, we are the Texas payday lender for you. As we’ve done our best to show in today’s blog, we care about our Texas neighbors and their livelihood. If that means getting you the payday loan you need, then great! We hope it can help get you back on your feet. If our words of wisdom help you just a bit, then that’s great as well! For an emergency cash loan in Texas, apply today!